Money has taken on many forms over millennia; our relationship with currency often alters along with it. Lately, a key theme has been technological change to a cashless society: notes and coins, initially pushed off centre stage by debit and credit cards, are increasingly being replaced by digital alternatives to cash, including mobile payments. The ING International Survey Mobile Banking 2017 – Cashless Society report explores the attitude of the general public in 15 countries around alternatives to cash. Our results suggest a cashless society is not only possible but could be accepted by at least part of the population in many European nations. 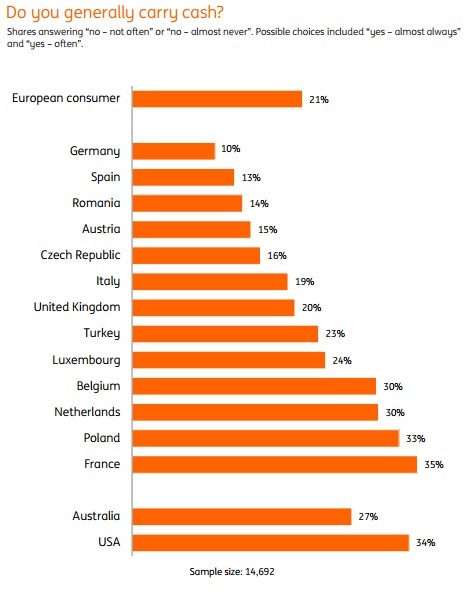 About one in five (21%) in Europe now say they rarely carry physical notes and coins. 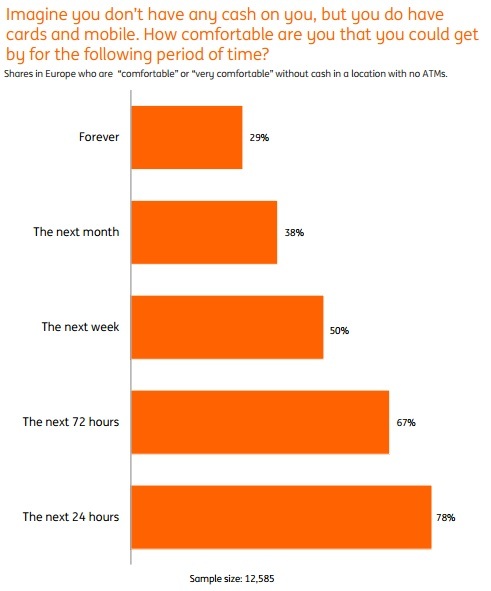 Many are reducing cash use 54% of people in Europe agree or strongly agree that “I use physical cash much less than 12 months ago”. Of that proportion, nearly 8 in 10 (78%) also say they expect to go on using fewer notes and coins in the next 12 months. Once people start to reduce their cash use, it seems they’re inclined to go on using less cash. This year’s results tally with our mobile banking surveys in 2016, 2015 and 2014 which also found people are reducing reliance on physical cash. Increasingly they’re transacting via non-cash methods, including mobile payment apps. In fact a fraction of the population appears to have largely dispensed with cash. This subset only uses notes and coins once a month, once a year or even less often. Living comfortably without physical cash was considered the stuff of science fiction only a few decades ago. Today it is a realistic proposition. However, we also see a gulf between those choosing to use physical cash less often and those who – currently – are sticking with notes and coins. About a third (34%) agree that if it were up to them, they would go completely cashless – although there are differences between countries. Meanwhile, more countries are actively discouraging or outlawing large cash payments. Non-cash transactions may be preferred by some vendors. Harvard professor of public policy Kenneth Rogoff, writing in his 2016 book The Curse of Cash, argues that physical cash can facilitate corruption and tax evasion. In his view, many of its disadvantages could be usefully reduced if larger denomination notes were withdrawn from circulation. In our survey, just six percent in Europe indicate it might affect their finances if the largest denomination note was withdrawn in their country. Indeed, large denomination notes are being phased out in several countries. The €500 bill, set to be withdrawn by the end of 2018, is one example. But if Rogoff is correct, there may be no need to go entirely cashless to obtain a better quality of life. For those who want or need the feel of cold, hard cash, that could still be possible without holding back the many who indicate they are comfortable with new ways of paying. The ING International Survey aims to learn how retail customers – and potential customers – around the globe spend, save, invest and feel about money.